Beauty and the Beast (French: La Belle et la Bête) is a 2014 Franco-German romantic fantasy film based on the traditional fairy tale of the same name by Gabrielle-Suzanne Barbot de Villeneuve. Written by Christophe Gans and Sandra Vo-Anh and directed by Gans, the film stars Léa Seydoux as Belle and Vincent Cassel as the Beast. The film was screened out of competition at the 64th Berlin International Film Festival and was released in France on 12 February 2014 to positive reviews, becoming a box office success. International reviews were more mixed. It was nominated for the People's Choice Award for Best European Film at the 27th European Film Awards. It also received three nominations at the 40th César Awards, winning Best Production Design for Thierry Flamand. A widowed merchant (André Dussollier) is forced to move to the countryside after going bankrupt, with his six children, three sons and three daughters. His youngest daughter, Belle (Léa Seydoux) is the only one happy with the change. When one of the merchant's ships is found, the merchant prepares to return to reclaim his assets. While his two older, spoiled daughters give him a long list of expensive things to bring back for them, Belle asks only for a rose. The merchant arrives and learns that the ship and its cargo have been taken to settle his debts. On the way home through the forest, the merchant loses his way, his horse slips and is injured, and they are attacked by wolves. He laments that he has "not even a weapon to finish off" the poor horse. The merchant stumbles upon the magical domain of the Beast (Vincent Cassel). In the castle, all of his needs are magically met, including food, the exact items his daughters had asked him to bring, and his horse, magically cured. He packs up and departs with the items. Passing through the garden, he recalls Belle's request of a rose, and he picks one. He is immediately confronted by the Beast, who thunders at him for taking the rose. As punishment, the Beast demands the merchant return to the castle in one day after saying goodbye to his children. If he fails to return, his family will be killed. The father returns home and tells the story to his children. Learning of her father's fate, Belle, feeling responsible, takes her father's horse and returns to the castle to offer herself in the place of her father. At the castle, Belle is accepted as a substitute for her father. She is given luxurious goods and permission to roam the grounds, but must return every evening for dinner with the Beast warning her not to escape. At night, Belle has a vivid dream, revealing the backstory of the Prince: he enjoys hunting, but often ignores the Princess (Yvonne Catterfeld) who loves him but is lonely. The Prince is after an elusive golden deer, and when the Princess asks him to stop hunting the deer, he promises to do so if she will give him a son. Belle wakes to find the Beast watching her sleep before he suddenly flees. Belle explores the castle grounds, eventually finding a statue resembling the Princess from her dream. At dinner, the Beast displays a rather cold exterior towards Belle while attempting to charm her, only to be rejected. He suddenly bursts out at Belle stating he will claim her despite her resistance. She later has another dream: The Prince announcing that he and the Princess will have an heir, but when she reminds him of his promise, he seems to have forgotten. During dinner, the Beast apologizes for his previous behavior. Belle makes the Beast a proposal; she will dance with him, if she is allowed to see her family one last time. The two begin to dance though amidst it all, the Beast asks for Belle's love. Jarred, Belle demands to see her family as she had bargained. When the Beast refuses, Belle fervently rejects him once again. That same night, she witnesses the Beast prey upon and devour a hog. In shock, she attempts to escape by running into the enchanted forest only for the Beast to catch up to her on the frozen lake. As Belle is suddenly knocked down and pinned, the Beast attempts to kiss her when suddenly the ice beneath her breaks as she sinks into the frozen lake. The Beast pulls her from the water, and brings her back to the castle. The Beast agrees to let Belle return home, giving her a small vial of healing water. He tells her return to him in one day or he will "die". Belle arrives home, where her father is bedridden, and seems to be dying. She pleaded for him to wake only to fall asleep. Belle's eldest brother, Maxime (Nicolas Gob) finds a jewel on her clothing, positing that the castle may contain further treasures. He wants to find it to settle his debt to gangster Perducas (Eduardo Noriega). He knocks out his youngest brother, Tristan, who tries to stop him, and meets with Perducas and his gang, leading them to the castle. Belle has one final dream about how the Prince broke his promise and killed the golden deer. While dying, the deer transformed into the Princess, revealing she was the Nymph of the Forest who became human because she wanted to experience love. She begged her father, the God of the Forest, to spare the Prince from his wrath. But he transformed the Prince into a beast, changed the hunting dogs into Tadums, and his friends into statues. The God of the Forest proclaimed that only the love of a woman would break the Beast's eternal curse. Belle awakes and gives her father the vial of water, reviving him. She attempts to return to the castle, and discovers that Maxime has taken the horse to meet with Perducas. Tristan takes her to the castle, arriving just as the Beast is about to kill the invaders, including Belle's brothers. The Beast stops his attack when Belle begs for mercy. Perducas stabs the Beast, mortally wounding him. Suddenly, vines sprout about the castle destroying anything in their paths. Perducas's lover, Astrid, is killed when he abandons her, but not before cursing him of his fate. Perducas is soon killed by the vines and turned into a human tree. Belle and her brothers carry the Beast into the castle, and place him into the healing pool of water. Dying, the Beast asks whether Belle could ever love him, and she counters that she already does. The Beast sinks into the water then resurfaces, transforming back into the Prince and the Tadums back into dogs. The story is being told by Belle to her two young children. They are living in the same countryside house, surrounded by rose bushes, with Belle's father, who is now a flower merchant. Belle goes outside to greet her husband, the Prince, and the two kiss and embrace. Principal photography took place in Germany, at the Babelsberg Studio in Potsdam-Babelsberg, from November 2012 to February 2013, on a production budget of €35 million. The film earned a total of US$49.1 million internationally. In Japan, the film topped the box office on its release, making it the first non-English-language foreign film to top the Japanese box office since Red Cliff II in 2009, and the first French film to top the Japanese box office since Mathieu Kassovitz's The Crimson Rivers in 2001. In France, the film received positive reviews. France Télévisions called the film Christophe Gans' "greatest success". They praised the colours and contrasts of the landscape, which they said recalled the work of American painter Maxfield Parrish, and the visual style, which they compared to films by Mario Bava and Tsui Hark. They also noted that Gans had successfully differentiated the film from the source material and prior adaptations, while keeping the "spirit" of the original story. Laurent Pecha of EcranLarge remarked that while the film was "far from perfect", it was "so ambitious" compared to the "doldrums" of French cinema that Gans won her over. She called the introduction "spectacular" and praised Gans for his willingness to make the audience believe the "incredible and improbable love story", praising the "excellent" Seydoux and Cassel. Writing for TF1, Olivier Corriez gave the film 4 stars out of 5 and remarked that it was not easy to offer a modern interpretation of Beauty and the Beast as it had been adapted so many times before, but found Gans' film "flamboyant" but "accessible to all audiences". He said that it "plays wonderfully on contrasts" and praised Seydoux for her "charm and tenderness" and Cassel for providing "brutality [and] weakness." International reviews for the film were mostly negative. Although the visuals and production design were praised, storytelling was criticized. On review aggregator website Rotten Tomatoes, the film has a rating of 32%, based on 19 reviews and the average rating is 4.6/10. On Metacritic, which assigns a normalised rating out of 100, the film has a score of 39 based on 10 reviews, indicating "generally unfavorable reviews". Jessica Kiang of IndieWire thought the film was "immensely, crushingly boring" and Seydoux wasted in a role that required her to do little more than "heave her breasts and fall over things prettily." ^ "La Belle et La Bête". AlloCiné. Retrieved 2014-01-22. ^ "Christophe Gans • Director". Cineuropa. Retrieved 2014-02-24. ^ "Vincent Cassel et Léa Seydoux : Une relecture grandiose de La Belle et la Bête". ^ "Berlinale 2014: Competition Complete". berlinale. Retrieved 2014-01-15. ^ "EFA Opens Vote for People's Choice Award". European Film Academy. Retrieved 4 September 2014. ^ "European Film Academy opens vote for People's Choice Award 2014". Cineuropa. Retrieved 4 September 2014. ^ "Juliette Binoche, Marion Cotillard, Kristen Stewart Among France's Cesar Awards Nominees". The Hollywood Reporter. Retrieved 31 January 2015. ^ "Cesar Awards: 'Timbktu' Sweeps, Kristen Stewart Makes History". The Hollywood Reporter. Retrieved 24 February 2015. ^ ""La belle et la bête" et "Noé", deux films attendus en 2014". TF1. Archived from the original on 31 January 2014. Retrieved 1 February 2014. ^ Nancy Tartaglione and David Bloom (10 January 2015). "'Transformers 4′ Tops 2014's 100 Highest-Grossing International Films – Chart". Deadline Hollywood. Retrieved 10 January 2015. ^ Kevin Ma (12 November 2014). "Beauty and the Beast, Twilight top Japan B.O." Film Business Asia. Archived from the original on 12 November 2014. Retrieved 12 November 2014. ^ "La Belle et La Bête: Les critiques presse". 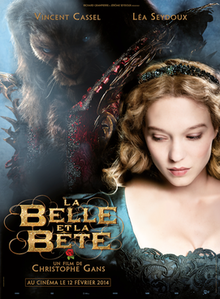 ^ ""La Belle et la bête" : Léa Seydoux et Vincent Cassel dans une version épique". France Télévisions (in French). 10 February 2014. Retrieved 16 November 2014. ^ "Critique : Belle et la Bête (La)". EcranLarge (in French). 12 February 2014. Retrieved 23 December 2014. ^ "La Belle et la Bête". TF1 (in French). 10 February 2014. Archived from the original on 2 December 2014. Retrieved 23 December 2014. ^ "Beauty And The Beast (La belle et la bête)". ^ "Beauty and the Beast". ^ "Berlin Review: Christophe Gans' 'Beauty And The Beast' Starring Léa Seydoux & Vincent Cassel". Indiewire. 15 February 2014. Retrieved 17 November 2014.